Explanation: What caused this unusual light rock formation on Mars? Intrigued by the possibility that they could be salt deposits left over as an ancient lakebed dried-up, detailed studies of these fingers now indicate a more mundane possibility: volcanic ash. Studying the exact colour of the formation indicated the possible volcanic origin. The light material appears to have eroded away from surrounding area, indicating a very low-density substance. The stark contrast between the rocks and the surrounding sand is compounded by the unusual darkness of the sand. 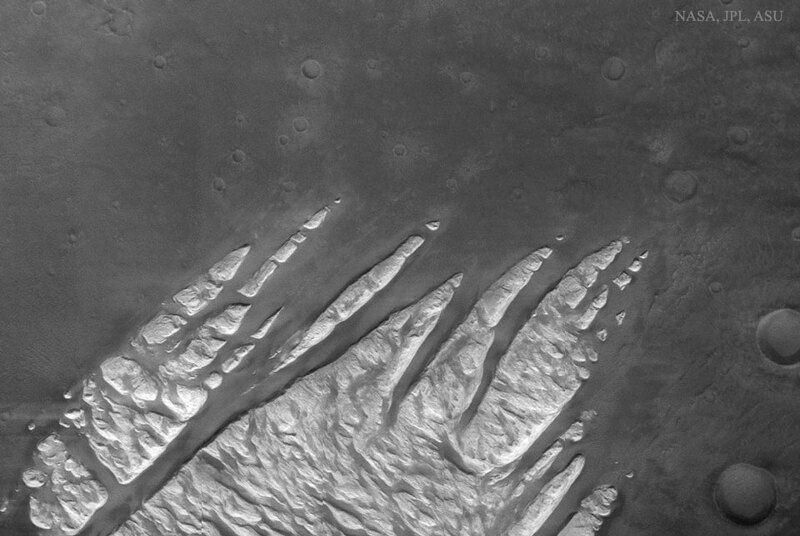 The featured picture was taken with the Thermal Emission Imaging System on the Mars Odyssey, the longest serving spacecraft currently orbiting Mars. The image spans about 10 kilometres inside a larger crater.